Box Art for Fernando Ruiz Miniatures. This was such a joy to paint, from the talented hands of Romain Van den Bogaert. 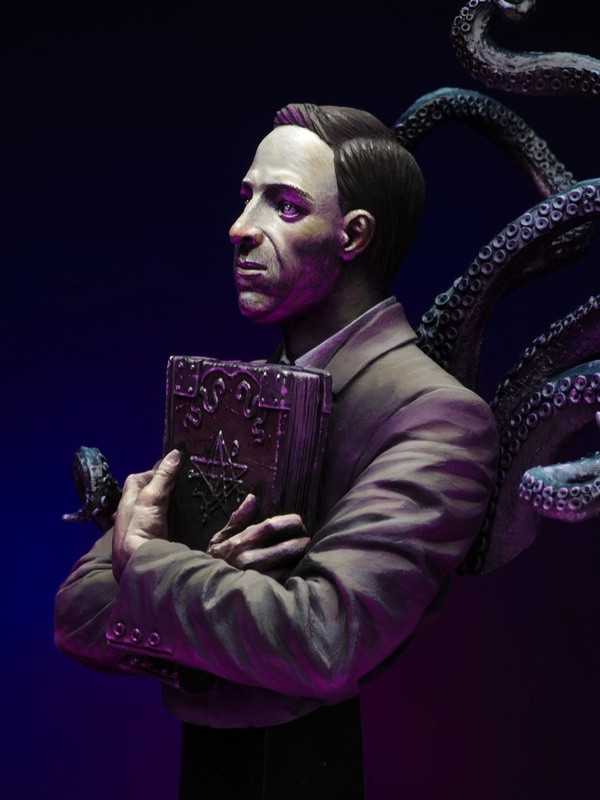 I am not a big reader and I don't have a lot of authors I admire for their style and atmosphere.... but I read every Lovecraft story I could get my hands on and the eery, dark, moody and thick atmosphere never fails to amaze me. Painting this bust was more than a painted bust for me. First, it was an honour to paint a bust by the amazingly talented Mr Bogaert. 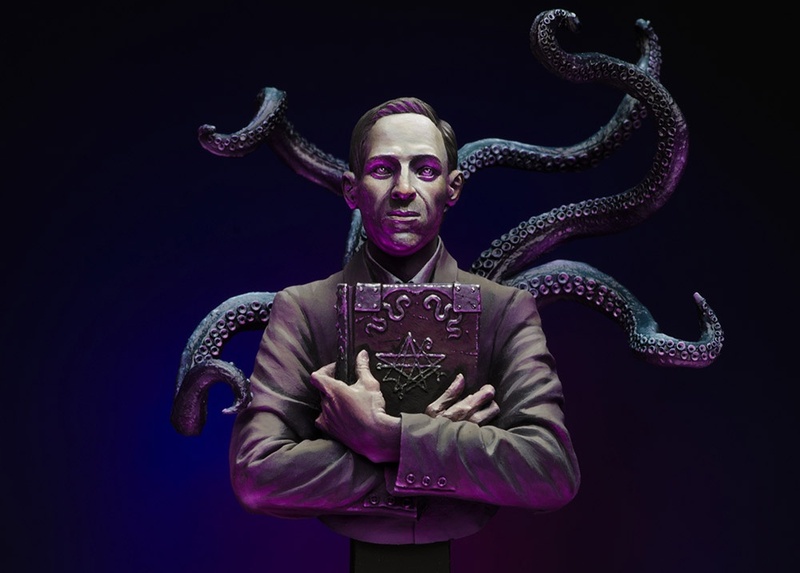 Secondly, I tried to express the feeling I have when thinking about Lovecraft. 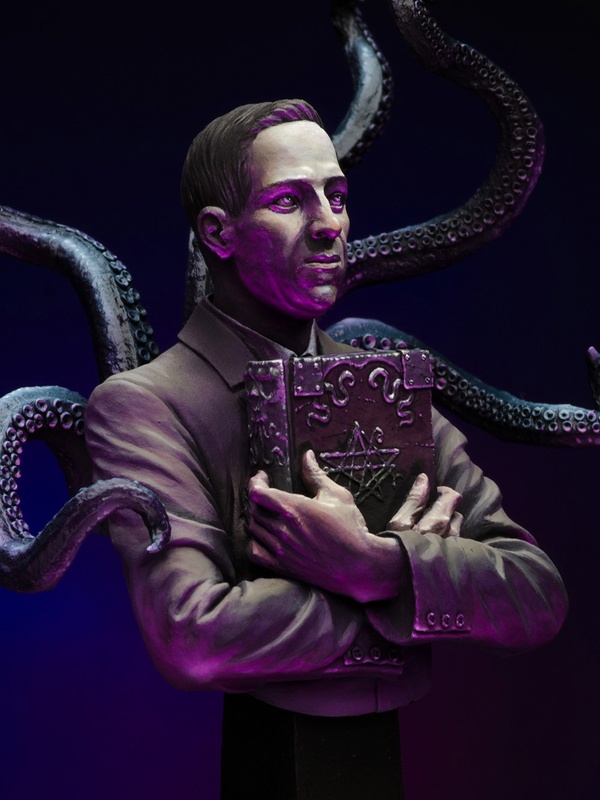 Even though I have to say that I think it's almost sad that most of the modern Lovecraft trend or fame only give him credit for the Chtulu part of his stories, even when I have the opinion that it's not about Chtulu what his stories are about. 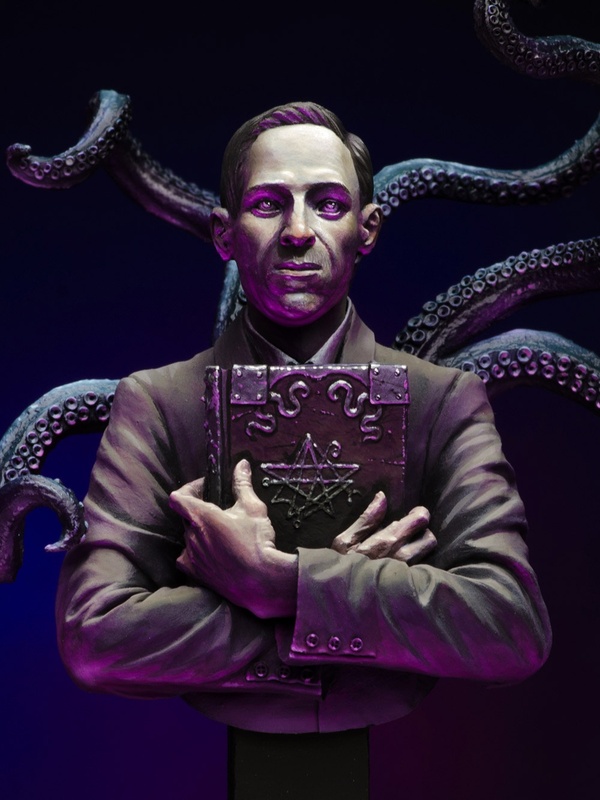 There are so many facets of Lovecraftian stories that are unfortunately ignored. For me, many of his stories are about an evil that comes from deep within us, created by yourself. That's what I tried to reflect with this painting. A very classical light setup used in old theatre and movies to emphasize something evil. Holding the Necronomicon, something purely evil... a tight grasp. 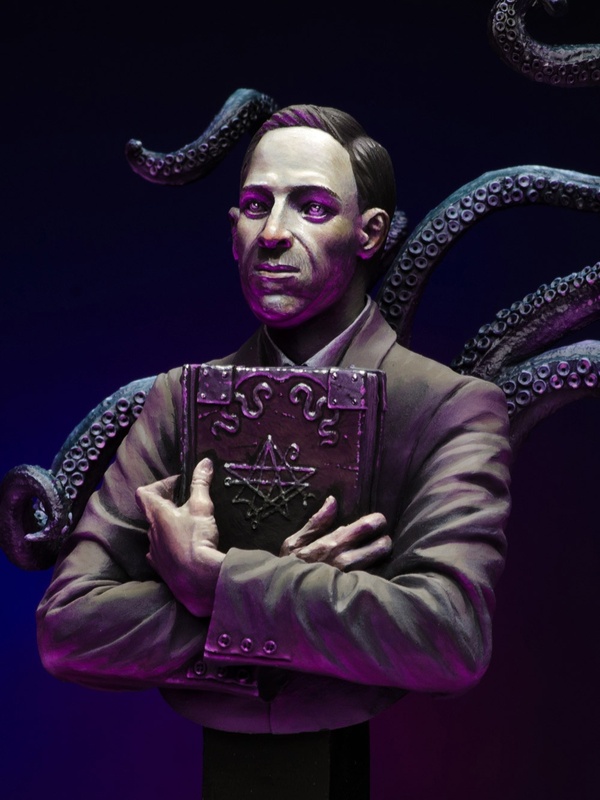 Is the creator of the Book holding the Necronomicon, or is it having control about Lovecraft? The project is for sale. If you are interested, check out my catalogue or write me a message. I prefer Lovecraft too, but I prefer the Allan Poe Mini. I like so much this paint job that I don’t think I’ll ever be able to visualise another paint job. Really quite stunning work dude, you’re very good at the glow effect. Such great atmosphere. I love the stories too—especially when they are more psychological than supernatural (or a blend of the two). one of your best painting! this is one of the figure i would love on my showcase forever. Fantastic. So wonderfully eerie. Beautiful work. BBBWWWWWWWWWWWWOOOOOMMMMMMMM!!! It vibrates in Magenta! Love it!